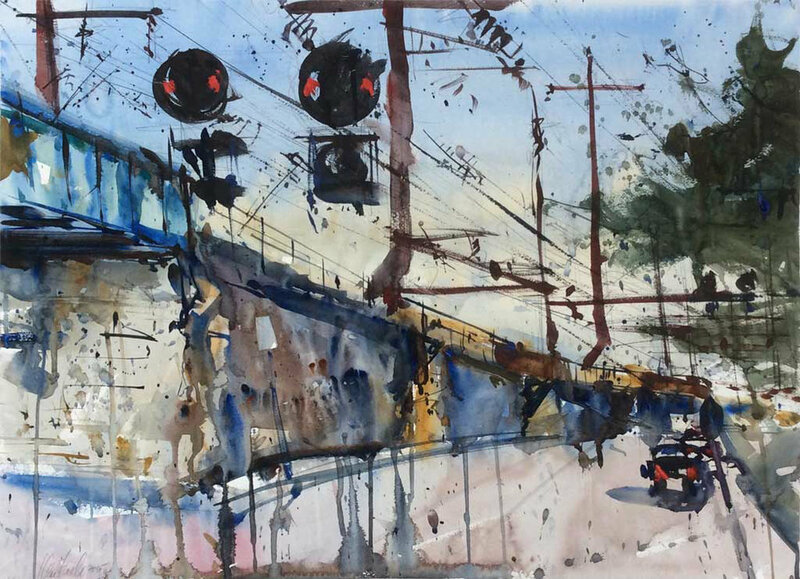 “Main Line Collision,” by Ken Karlic, watercolor, 22 x 30 in. 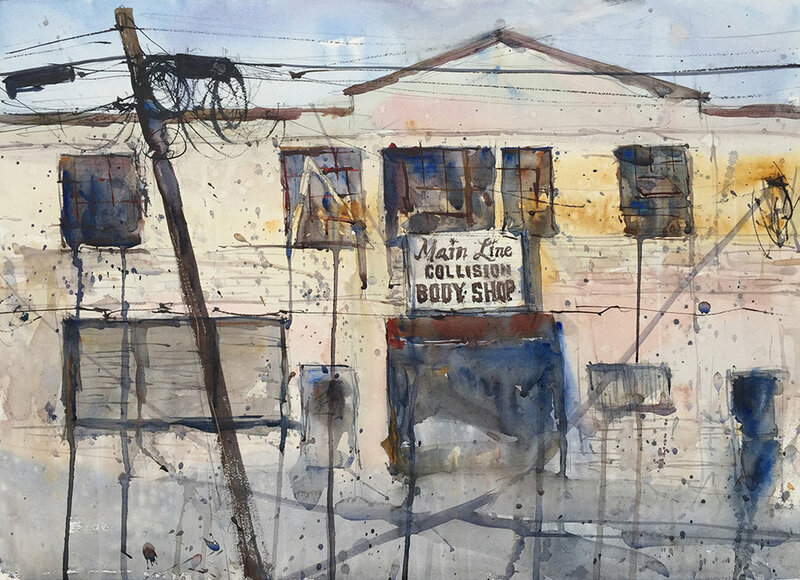 Maryland artist Ken Karlic lets randomness in his painting technique provide a gritty feeling to urban scenes and similar subject matter. Here’s how he does it. “Lady Carolyn,” by Ken Karlic, watercolor, 7 1/2 x 22 in. “Windows and a Door,” by Ken Karlic, watercolor, 22 x 30 in. “View From the Fifth,” by Ken Karlic, watercolor, 11 x 15 in. Karlic put this approach to good use recently at the Paint It! Ellicott City plein air event in Maryland. An industrial building vibrated with subtle color variations; two old trucks boasted convincing rust. “Watercolor really lends itself to gritty subject matter,” says the artist. “I enjoy the weathering of materials, the look of old barns and classic vehicles. Sometimes I splash in thin washes really fast, then build up levels of opacity. I like the randomness of flicking some paint off of my fingers, whether it is a thick slurry of paint or thinned watercolor. I’ll scrub it out with a wet brush or scratch it with a fingernail. 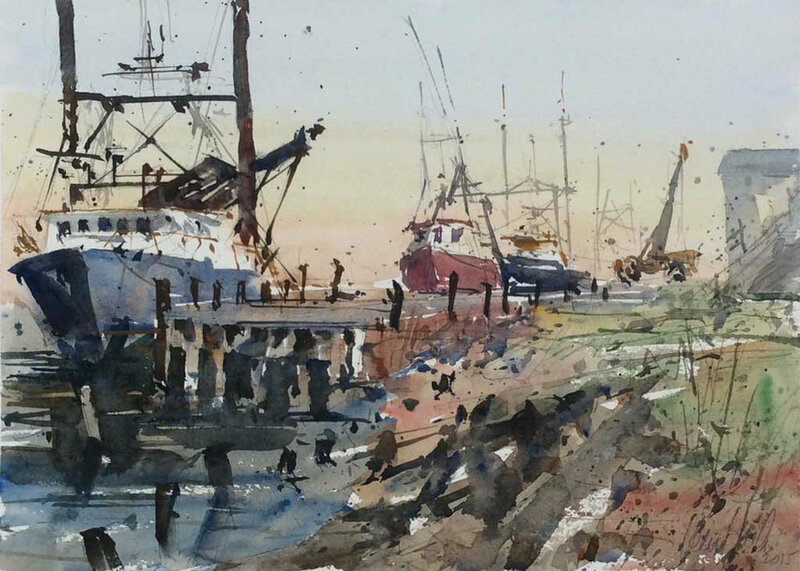 “After the Haul,” by Ken Karlic, watercolor, 11 x 15 in. “Age and Beauty,” by Ken Karlic, watercolor, 11 x 15 in. “Incoming,” by Ken Karlic, watercolor, 22 x 30 in.